What does it mean to have an identity? Forgive me if I’m about to get a little abstract. If you are the kind of person who runs for the hills whenever philosophy starts to rear its lovely head, then you might want to start slipping into your running shoes. But it seems recently like I’ve been doing nothing but talk about identity of one kind or another. So I thought that it might be worthwhile to take a little time to ask the question, what does it mean to have an identity? As I see it, the structure of identity is basically twofold, consisting of an internal and an external face. The internal aspect of identity boils down to the way I see myself, or want to see myself–both the way we are and the way we feel we ought to be both play an important role in how we perceive ourselves. 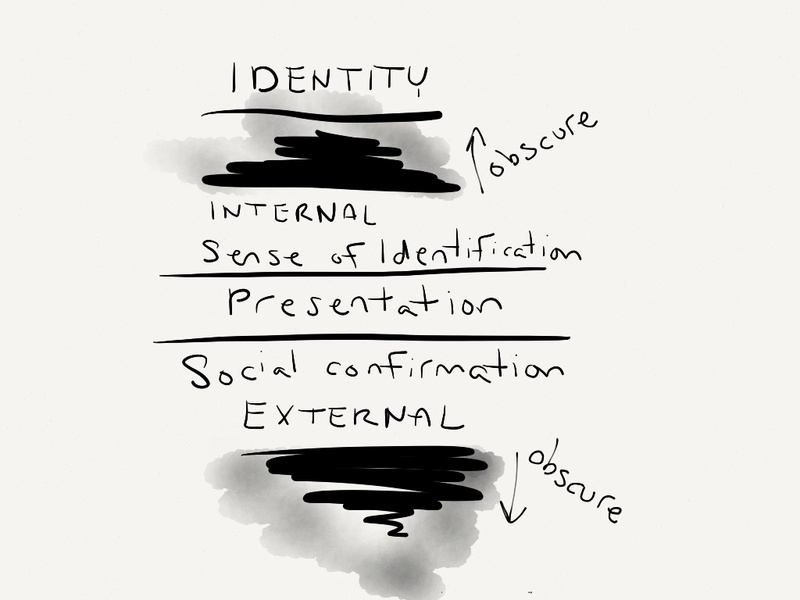 On its other face, identity has an external component consisting of social confirmation, recognition and–frequently–enforcement. We might want to claim that this aspect of social recognition is strictly speaking external to identity, that a person is what they are because of what they are, not because of how other people perceive or recognize that fact. But the fact remains that an identity is not merely something internal and self-defined–it is also a social reality that affects the roles we take on and the way we relate to the people around us. Even so, the highly individual ways in which we come to understand our own natures and roles in the world do not exist in a vaccuum. A big part of the way in which we form our own identities is by observing those around us and identifying others we experience to be like ourselves. This process of identification–of feeling a heightened sense of kinship with certain others and seeking to have that kinship recognized–is extremely important to the way our own inner sense of identity comes to find itself. This is why being refused the connection that comes with having our sense of who we are recognized and supported can be so emotionally crushing–without the ability to connect with others who share important aspects of our own identity it becomes virtually impossible for that identity to grow and flourish. The practical upshot of this is that neither aspect of a person’s identity is indepenedent from the other. They influence one another in a variety of complex ways. This complexity is only increased by the fact that we never have just a single identity, but multiple identities that overlap and interact as well: gender, religion, national citizinship, ethnic background, community, economic class, etc., etc., etc. The field on which all these interactions meet and play out is that of presentation. Presentation is what we call the amalgamation of external signs and behaviors with which we “play out” our identities in the world around us. It can include everything from the clothes we wear to the language we use, from how we interact with different kinds of people to what we eat. Presentation represents the meeting point between our internal sense of self and the way others understand us and expect us to behave. How this all plays out depends to a large degree on the individual and their relationship to the social environment in which they find themselves. In some ways, my own sense of identity and the perceptions and expectations of those around me will coincide, in which case presentation serves as a shared medium/network of meanings that I and those around me use to interact. In other ways, my own sense of who I am may differ from the way others understand me, sometimes to an extreme degree. In these cases, my presentation ends up becoming a battleground on which I strive to have my understanding of who I am recognized while others strive to make me acknowledge their perception of me and abandon my own. In the preceeding paragraphs I’ve attempted to lay out in general terms a few ideas about what it means to have an identity as a human being. If all this comes across as somewhat abstract and academic, I hope that it will nevertheless help to serve as a kind of framework for some of what I want to write about some of the specific areas of identity that have had a serious impact on my life, namely gender and Jewishness. My hope is that this framework will help to hold up the ways in which what I want to say about identity in these two areas is more closely related than it might otherwise seem.